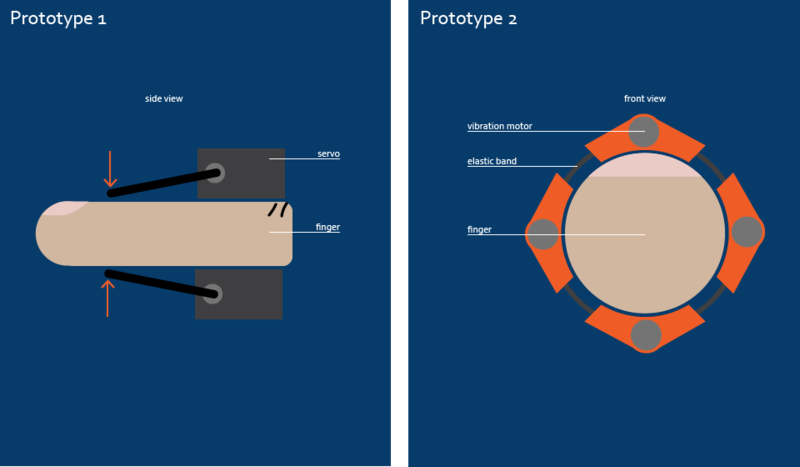 A feedback system shaped as a ring and is put on the finger to add haptic feedback to interactions that lack this quality. 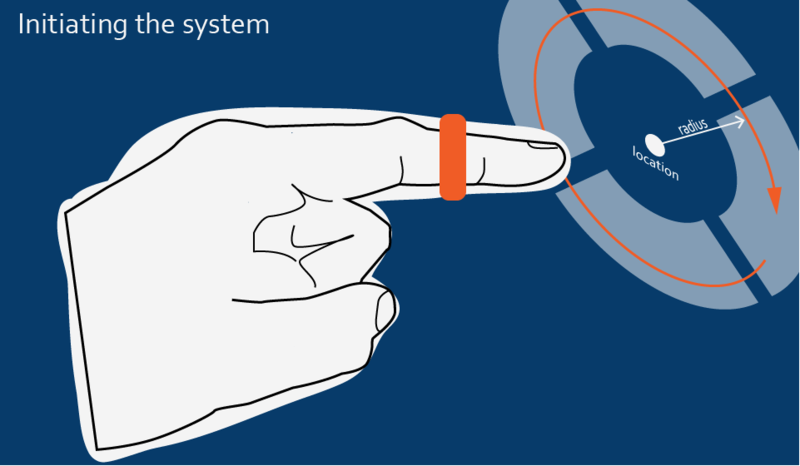 In this concept, the ring is used to add haptic quality to interactions via a leap motion in a car. Being able to feel (and unable to see) the interface of a car media system is a way to make interaction with such systems safer during driving. In the off state, the system is waiting for the user to make a circle gesture. 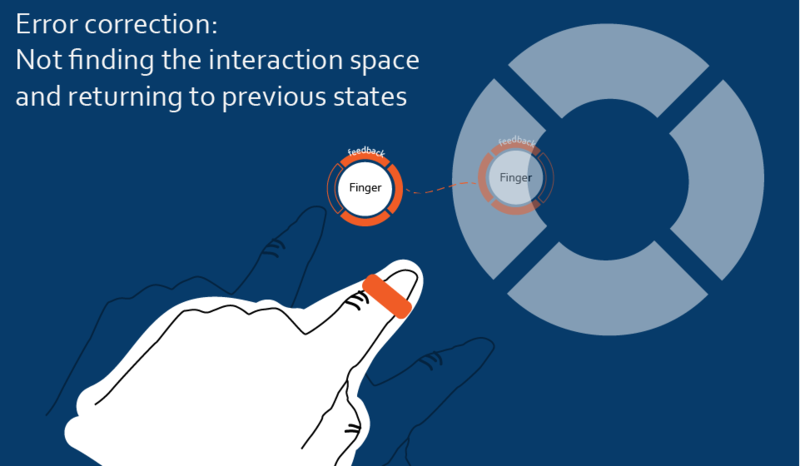 When a user wants to start interacting with the system, he can get the system to attend by making a circle gesture (‘drawing a circle’) with his finger. The location and radius of that gesture are then used by the system as the location of interaction. Menus consist of a circle (with the radius and location of the gesture from the system initiation) with the options as active areas on its perimeter. These active areas can be felt by the user through the feedback ring. When the user moves into one of the active areas audible feedforward, on what option the user is about to select, is given. If the user decides he is on the correct menu option, the option is selected when he keeps his finger there for 3 seconds. 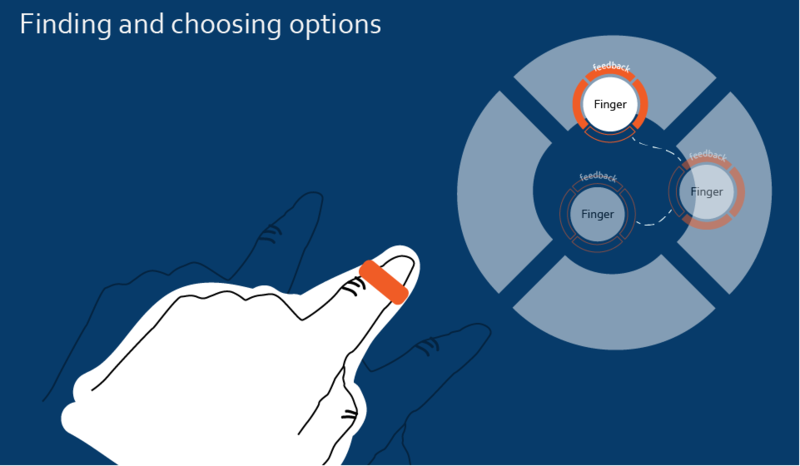 When a user moves his finger outside of the interactive area, the feedback ring guides him back by applying feedback to the opposite side of the finger. When a user selected the wrong menu option or wants to go back to the previous state, he moves his finger outside of the perimeter of the circle. If he chooses to ignore the feedback that helps him return to the interactive area, the system returns to its previous state. If this is done at the highest level state (the main menu) the system disengages and returns to the off state. The sensor used in this application is a Leap Motion (https://www.leapmotion.com/), an IR operated 3 dimensional hand and finger tracking device.The sensor is provided with software that is analysing raw data from the sensor and outputs it into a collection of parameters through an API. These parameters are, among many others, pitch roll and yaw of the hand and length of the individual fingers. The software also recognizes certain gestures. For the concept that is developed, extra physical elements were added to the fingers. Because the sensor visually recognizes fingers, this caused jitter in the sensor output. The sensor sometimes lost track of the fingers, did not recognize any fingers at all or picked up a different finger. To reduce the effect of this jitter, two filters were put in place. The first filter is a smoothing filter, it takes 5 sensor readings and uses the 3rd one to determine where the tracked finger was at point in time. The second filter assures the quality of the readings that the first relies on. Before readings are added to the array of the first filter, it is checked if the Leap motion is tracking any fingers at all using a try-catch method. Applying these kinds of filters has to be done with caution as they increase the systems latency. The first filter for example, causes the system to react 5 times slower to changes in the physical world. This increased latency however, does not sum up to be in the way of the user experience. The initial latency is about 30 milliseconds which means that the increased latency will be around 150 milliseconds (as the system takes 5 sensor values and uses 1). This is a considerable delay but it is argued that the way that this system works makes it less prone to suffer from this latency. That is because the feedback is only applied to one sense (the feedback is only haptic). This does not mean that the systems performance is not negatively influenced by this latency. But user tests show that and otherwise noticeable latency does not pose a problem in this application. Next to the signal filtering the construction of the feedback module was also changed. The first prototype caused many of these problems because of its size. It was therefore desirable to develop a feedback module as compact as possible. A change was made from bulky servo’s to vibration motors. This made the feedback module much smaller and proved to be a big improvement towards smoother interaction.